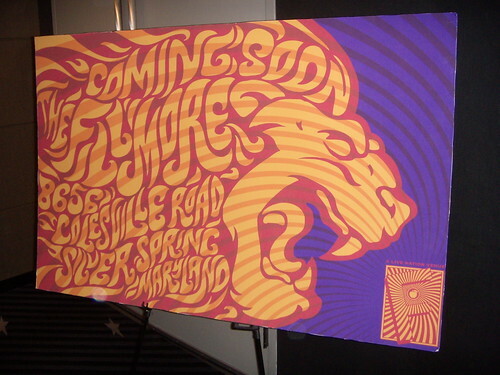 Residents are concerned that the new Fillmore club on Colesville Road - named for a fixture of the 1960's counterculture scene - will attract the wrong crowd to Downtown. With the Fillmore nearly a done deal for Silver Spring, local residents frustrated by the loss of the Birchmere to College Park are crying foul over the County's handling of the situation. "They're getting a huge break for this," laments Rich Swanson, referring to the $8 million of County and State money presumably going to Live Nation, the national concert promoter who will operate the venue. (Doug Duncan, now an official at the University of Maryland, is currently trying to take that money - originally earmarked for the Birchmere - to its new location in College Park.) "I find it kind of offensive that my tax dollars are being used to subsidize the world's largest music venue." Swanson led the charge to reinstate talks between the County and the Birchmere before they collapsed last summer. "I'm ecstatic about the Birchmere coming to College Park," says Swanson. "And it's really a shame. I thought it would fit well in Silver Spring." A look at the acts playing a Fillmore venue in Philadelphia - emo band Thursday; indie darlings Minus the Bear; edgy comedians Brian Posehn and Maria Bamford - suggest it would attract younger music fans, a crowd that's already frustrated some residents. Last week, the South Four Corners Community Association, had a popular go-go event at the Silver Spring Boys and Girls Club shut down in favor of what the neighborhood called "more traditional" programming. 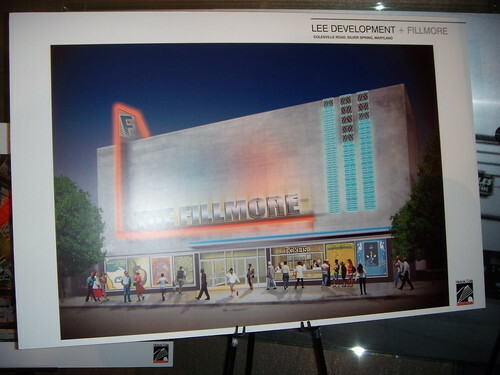 A rendering of the Fillmore, a music venue that will open on Colesville Road by 2010. "My biggest concern is that Fillmore does a better job of outreach to the community than the Birchmere," suggests Philip Olivetti, member of the Silver Spring Citizens Advisory Board. "I think they'll go a long way in winning over older people." On the Woodside Park Community Association listserv, a hotbed of Birchmere/Fillmore debate, the comments suggest that there's a lot of convincing to do. "The majority of WPCA residents were not seeking a 2000 plus standing room only music venue for music that most of us in the WPCA never heard of," writes Woodside Park resident Bill Borwegen in a series of posts. "Bethesda gets Strathmore Hall and now Silver Spring will get two thousand more teenagers roaming the streets any night of the week. My kids will love it." And for some residents, that's exactly the point. Mike Diegel of Allied Civic, an umbrella organization covering about forty East County civic groups, looks forward to seeing shows at both the Fillmore and the Birchmere with his wife and their teenage children. "I'd go to the Birchmere. I'm a fan . . . but it's a major production to get there," says Diegel. "I think this [Fillmore] has got a lot more to offer." In exchange for the rights to operate the venue, Live Nation will be required to set aside a certain number of dates each year for Montgomery County events, such as benefits and graduations. Offering something for local residents was an imperative, says Leggett and County Councilwoman Valerie Ervin (D-Silver Spring). "It hasn't been an easy process, but we listened to the community's concerns," said Ervin at Wednesday's press conference announcing the Fillmore deal. "And Ike Leggett and I will continue to do so." Olivetti expects that the County and Live Nation will hold to their promises. "I've known Ike twenty years. He's a man of his word," says Olivetti. "I think he'll do the right thing." I wonder if the hip hop and R&B fans in P.G. are complaining on their community listservs about how the new venue is going to bring the undesirable folk music crowd into their neighborhood. Probably not as the folk music crowd isn't prone to violence, drugs and other wonderful activities. The Fillmore will have such a wide range of acts that all the naysayers will fall on their swords and go to a show sooner rather than later. The folk music crowd isn't prone to violence. The folk music crowd are the people who got us in Vietnam, Iraq and any other wars that may occur.. What!! Folk music leads to war? Are you crazy? Well listen to the music and read the lyrics people-wake up! "If I had a Hammer"--I would hammer out justice, and freedom--that doesnt sound too peaceful. "If I Had My Way"--If I had my way in this wicked world, I would tear it down. So, is the Birchmere run out of Langley or by the Pentagon? Bob Dyln wanted to know..."How many times must a white dove..." and How many times must a man die..." etc etc." Then he says "...the answer is blowing in the wind...". b-- if you dont know sarcasm when you read it you are definitely lacking a sense of humor= leave out the name calling and lighten up--or else people might think you are a close minded nut job. Ha! And lest we forget--"Fold music crowd isn't prone to drugs..."
Hmmmm what was that song --uhhh "Puff the Magic Dragon..."
Yikes-- what is that song all about???? and again-- the song"If I Had My Way"
One of the lines says "and Samson picked up that jawbone and swung it over his head .. and before he knew it a thousand were dead-- if I had my way...."
rtsind, I'm b, the one who asked if the Birchmere was run out of Langley. I am not the b who called you a nut job. I have no idea who the other b is, but I wish they would move on to c or d. I can piss people off all on my own, I don't need any help.